​The Hotchkiss M1909 machine gun was a French designed light machine gun of the early 20th century, developed and built by Hotchkiss et Cie. It was also known as the Hotchkiss Mark I and M1909 Benét–Mercié. It was adopted by the French army as the Hotchkiss M1909 (or Mle 1909) in 1909, firing the 8 mm Lebel. A variant to use the .303 round was produced in Britain as the "Hotchkiss Mark I" and manufactured by Enfield. The British army employed three different types of machine gun: the Vickers medium machine gun, the Hotchkiss (for cavalry and tank use), and the Lewis Gun with the infantry. It was adopted by the US in 1909 as the "Benét–Mercié Machine Rifle, Caliber .30 U. S. Model of 1909" firing the .30-06 cartridge. The name comes from three sources: Hotchkiss, the name of the American Benjamin B. Hotchkiss who started the company in France; the two main designers, Laurence Benet and Henri Mercie; and the US designation system at time which label arms with "Model of Year". Laurence Benét was related to Stephen Benét, who was Chief of Ordnance at the time of its designation. It is also known as the Hotchkiss M1909 and M1909 Benét–Mercié, but should not be confused with the heavier Hotchkiss M1914 machine gun. It was also used by other countries, including Belgium, Spain, Brazil and Australia.. 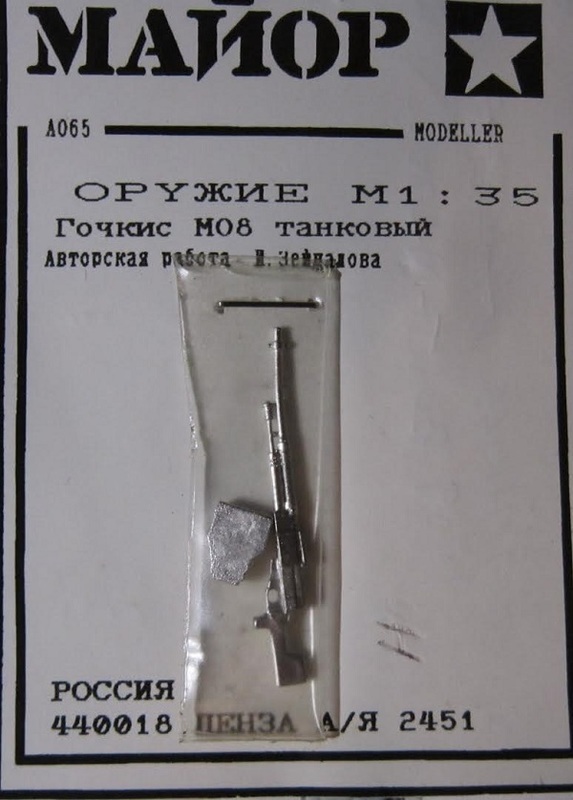 This white metal set is in two parts, the machine gun and a magazine. The detailing is very good. I haven't a clue of what MANOP means in Russian and the header card that the cello bag holding the parts is stapled to is all in Cyrillic Russian. ​I got this set and 3 others by MANOP years ago in trade with a modeler in Warsaw.